The chart for this stitch is very simple. So, I decided to use different beads in place of the French knots to show how cute even a very simple stitch can be. While seed beads are a favorite for use instead of French knots, because of their relative size, other beads can also add more texture. 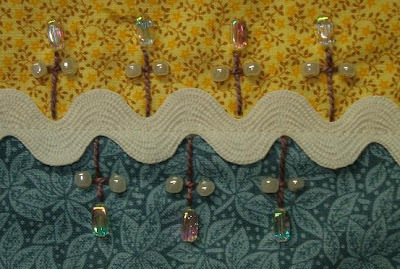 Changing up the shape of the beads within the stitch also adds movement and texture to your patch! Try combining different bead types, sizes, colors and create this really fast little stitch combination! Also, laces that have scalloped edges could be a good candidate for this kind of stitch (at least one side of it)…to add extension to the lace piece. 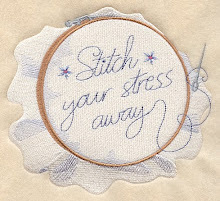 Let your mind imagine all the possibilities for stitches…and don’t just leave them for seams! Create a practice piece…or strip…and just play! You don’t have to show it to anyone else!! (unless you blog it to the world! ; then all see your success and your failures! )…but that’s how we learn. Rickrack is a good divider when two fabrics are very different in color. Then you could alternate the color of you thread to mirror the opposite fabric choice! 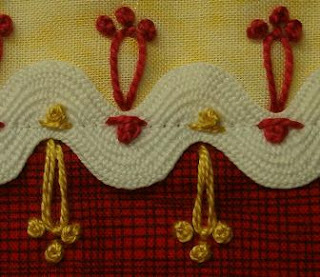 For example, green and yellow with white rickrack could have green stitching on the yellow fabric side, and yellow stitching on the green fabric side! This is a great way to blend patches together…that normally, would not appear to work well in the same area. Here, I’m using the same thread colors on that fabric because I’m trying to also use up excess threads (specifically perle cottons) in this challenge as well. The French knots have been replaced with seed beads in pink and yellow to show how changes in color add more movement in your design. Personally, I will be using this seam again as it really fills the space well! You could continually decrease the “stem” straight stitch to work into triangle shaped patches as well! Very versatile! 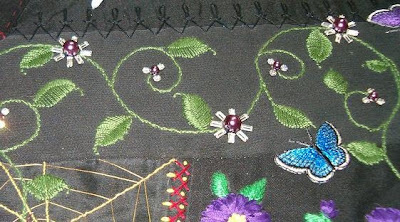 The French knots have been changed to blue seed beads in this stitch. The depth of the rickrack changes the stitch because the straight lines at the base of the detached chain line up instead of staggering. I think this would be a good seam to use really thin rickrack in, and stitch the detached chains outside of the rickrack, with the straight stitch on the rickrack. Rocailles beads would be a great size to use with the mini rickrack. I hope you are enjoying working with rickrack…we have several more seams to go! I like this simple little plum seam! It would be a good one to use and alternate perles and porcelain flowers in place of the French knots! As you see by these rickrack sample seams…I’m tired of stitching on white fabric with black lines! So, my model piece is now a long strip pieced multi colored fabric. I took 5 inch pieces of scrap fabric, cut them in half…and strip pieced them to a long piece of muslin about 6 x 24. The seams have been covered with large white rick rack to allow for these seams. This little stitch is cute. The yellow is double thread because it is a smaller weight (perle size 12) than the red (perle size 8) so I thought it needed more weight to balance it out. The French knots would be great if changed to seed beads! Rick rack isn’t just for your grandma’s aprons anymore! It can be a very beautiful seam treatment too! By the way, it can also make pretty flowers…or cabbages even! Seams can be really nice when done in rickrack. You have a wide selection of colors to choose from, texture is added to your project, and you have several widths available to you as well! So, the next few seams will use rickrack! Now, don’t think that you have to limit yourself however, these seams will work just fine along a curved stitched line as well! So, if you don’t have any rickrack to play with…just stitch some continuous curves! This first seam is very, very simple to do. One straight stitch, two leaves, and 3 little French knot buds! Enjoy! I just loaded the 4th template onto the CQ Wiki Site. It is free after you log in. Scroll down under the CQ Lessons and Info and select the templates folder. Any/all of the template sheets can be printed onto clear velum. If you don't have velum, print them onto paper...and take that to any local office supply store that makes copies. Request a "transparency" to be made...they are less than $2 each...some places charge less than $1 each. After you have your clear velum print or transparent copy. Cut the page into strips, allowing each of the individual template to be a single strip. Use a tiny (1/16th size) hole punch (available in the scrap booking section of any hobby store)...to punch out the marked holes. 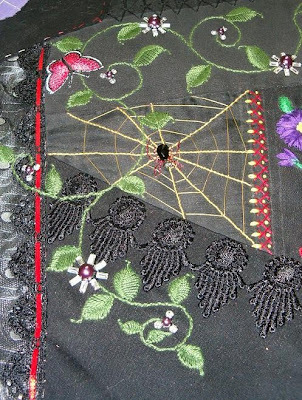 Each marked hole represents the "spot" for the needle to enter the cloth to create the templates' stitch. This is an easy process...and a great time saver! 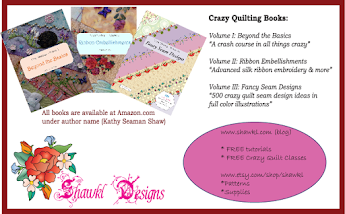 It also produces uniform base stitches for this challenge...then follow along and stitch all of these combination of very basic seam treatments for your Crazy Quilt projects! This is the last of the half-oval base stitch. This version is done in variegated pink with perles. As I post the picture, I can see that it is a little wobbly…guess I should not be stitching these at 3 a.m! So, hopefully you can follow the chart and not my example with creating this one! The next few stitches will use the half-oval idea…layering that image on top and bottom, in alternating curves. The charts are drawn using the template…but the same idea can be done using rickrack as it has alternating “peaks and valleys”. 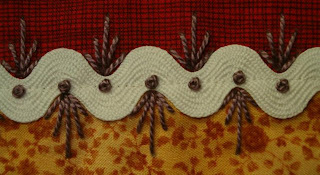 So, watch tomorrow for ideas using rickrack as a seam base to stitch upon. The base of this stitch is the shape of a half-oval again; done in a wrapped back-stitch. 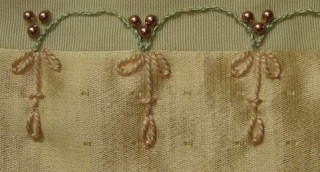 The straight stitches and detached chain stitches are done in pink; and the French knots in the stitch chart have been replaced with perle beads in a medium rose color. 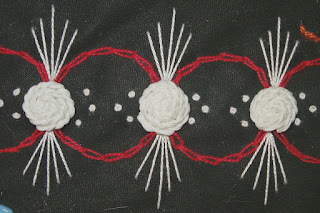 The base of this stitch is the shape of a half-oval again; done in a wrapped back-stitch. 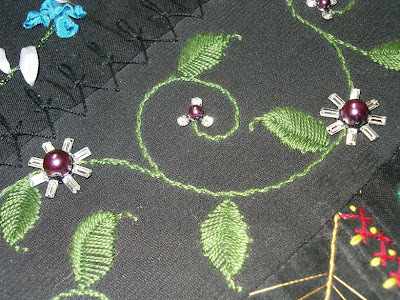 The French knots in the stitch chart (larger than normal) have been replaced with perle beads. The shape of a half-oval was done in a wrapped back-stitch. The curve and straight stitches were done in the same variegated green. 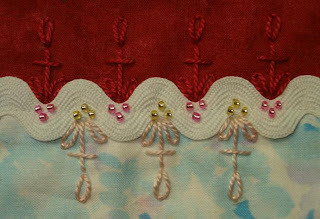 French knots in bright pink were completed last. The shape of a half-oval was chain stitched in bright blue. The straight stitches in green, and detached chain in pink were then added to complete this combination. This stitch was done using the template for the oval; turned sideways and only using the top half to mark the curves. 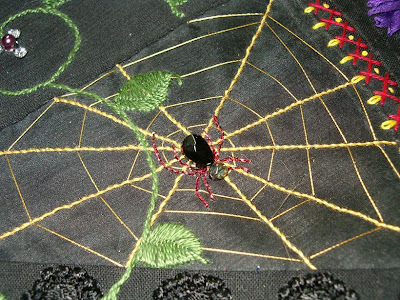 After backstitching along the shape of a half-oval, the stitches were whipped in the same color thread. Plum detached chain stitch and French knots finished off the stitch. 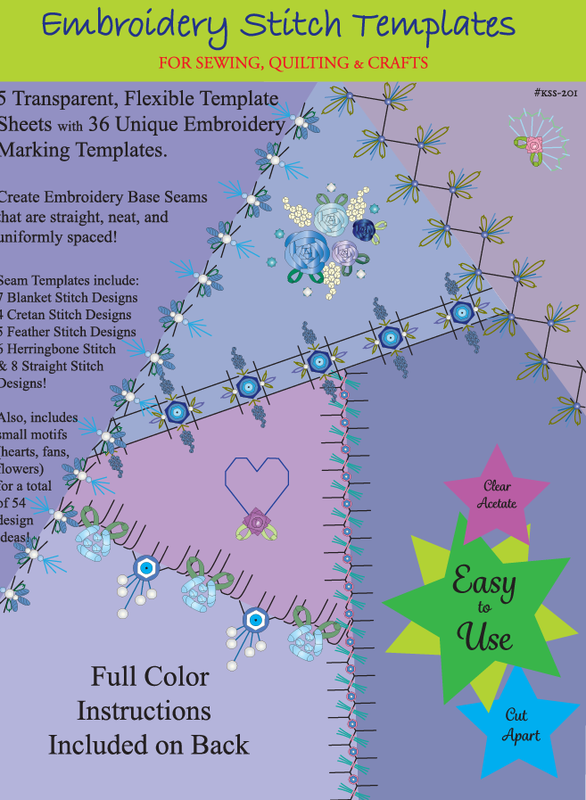 If you are just checking the blog…the templates are available at no cost for the base stitch. 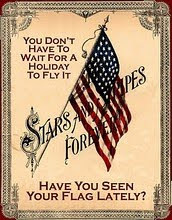 Directions on obtaining them are at the link above to the first post of this challenge. 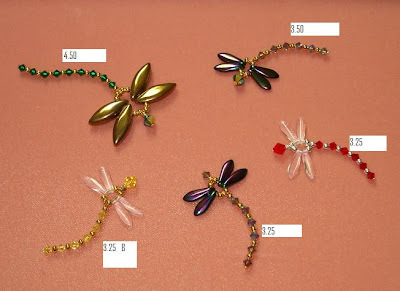 Recently I beaded up a dragonfly motif for a project. I made several different colors and shapes which I plan on loading into my Artfire Studio Site if I ever get a free minute to call my own around here! Here is a photo...with the prices as well. If anyone would like one before they are on my studio site, just send me a comment with your email (I won't post it publicly). Also, I'd be happy to make you one in any color you need...like the red one. All are done with Swarsvoski crystal bicones. The wings are glass on the smaller and metal alloy on the larger; each have round glass or metal beads between the crystals. The tails and body have wire armature, not thread. The tails have been slightly curved, but could also "fly straight" if you wanted. It is also possible to make them with a ring for hanging (from the top of the head) if you wanted to use them for earring or necklace drops. Finally, I have felt like a little stitching. Still battling this sinus crud...good days and bad. Here is some work on a round robin that is due...so gotta stitch even when coughing! The block had beautiful silk ribbon already...but needed some movement. So, I added a spider web first (my splash of color)...and then a vine that moves from bottom left up, across, and ends at right. Instead of more SRE, as I did not want to take away from the gorgeous work already down...I added flowers/buds of Swarovski crystal elements and Swarovski perles in two sizes.